Having spent the past fifteen years engaged with the unfolding evolution of the Halal market ecosystem, I want to offer some observations about where I think it is all heading. We are witnessing the emergence of a distinctly new market paradigm; from food to finance and including all the Muslim lifestyle products and services in personal care, health, travel, clothing, education, entertainment and media…and the business models that bring them to market. From my perspective, all of the statistics that are now emerging are like footprints in the sand that show that a mighty caravan is on the move. They are evidence of what has happened more than they are indications of what will occur in the future. They may well point in a certain direction, but they are only part of the picture. Clear intentions, creative thinking and strategic innovation are the keys that will shape the ways that this new paradigm will unfold. What is visible to us now are really just the early green shoots of a vast forest. As the citizens of the world – of every race, colour and creed – recoil from the institutionalised indifference, greed and corruption that threatens us, so we turn and seek ethical, moral and spiritual nourishment from our respective traditions and current thinkers to guide us through these uncertain times. Naturally, the Muslim world turns to the guidance of the Qur’an and Sunnah, and the social patterns of previous communities from the primal community of Madina through to the complex Ottoman structures of the market, the imaret and the awqaf. Combining these models and examples with the cutting-edge thinking around innovation and disruption is giving rise to a fresh crop of entrepreneurs, innovators and incubators putting their ideas to practical use. 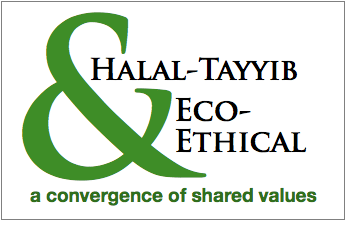 It is becoming increasingly evident that there is a broad spectrum of shared values between the parameters of Halal-Tayyib (lawful and beneficial) and the western-led movements such as conscious capitalism, social enterprise, impact investment, fair trade and other eco-ethical initiatives and movements. We are witnessing a convergence of values; values that increasingly have commercial weight in a growing ethical marketplace that is guided by a genuine concern for the well-being of others and our shared environment. These are shared values; we just tend to describe them differently. So, while there is a genuine need for the Muslims to educate the mainstream markets about the meanings of Halal and Tayyib, and the centrality of these terms to the lives of most Muslims, there is also a real need to describe these values in general terms that are understood by everyone, regardless of their faith. You don’t need to be an Arabic speaker to understand, just a concerned human being who is capable of empathy. Halal means lawful. So what does lawful mean? Which laws? And while the knee-jerk answer is ‘Shariah law’, we might do well to dig a little deeper. The divinely-inspired behaviour patterns underpinning this lawfulness can also be seen as the natural parameters for the well-being of the human creature. They are natural laws, in harmony with the ‘laws of nature’, and with our own human nature. Tayyib means wholesome or good, something we all understand, and also the underlying foundations for the entire health, whole and natural foods movement that is now firmly part of the mainstream….as mainstream as Amazon now. But there is more to this notion of ‘wholesome’, from a business perspective. It also speaks to the idea of embracing your entire commercial ecosystem. It means doing the best that you can, not cutting corners on quality or safety to save a few bucks; not just looking to maximise profits for shareholders; it means providing good conditions for your staff, and paying your workers fairly, and preferably ‘before their sweat has dried’. It means being concerned with the welfare of all those within the sphere of your business activity, including the animals and plants, the soil and the air and the water. Whatever business activity we are involved in, we have to make our offering – our products and services – as good as we can. We have to offer our best. Human beings have been created to care. Caring is part of our DNA. Caring about others as much as we care for ourselves is a kind of entry-level component of being an adult human being. Small children are entitled to be selfish. The rest of us need to take on the responsibilities of being human. And the Halal sector stakeholders and the eco-ethical communities need to recognise each other, and understand that we are all on the side of life; not death. We cannot leave the destiny of our shared world in the hands of the purveyors of death and destruction. This emerging shared awareness is bringing a new commercial paradigm to life, in harmony with the natural laws of life, and embracing our genuine efforts to offer our best products and services…our best selves…to others.